Sundar Pichai (Pichai Sundararajan), is an Indian American business executive. He is the Chief Executive Officer of Google Inc.Sundar was on 12 born july 1972. 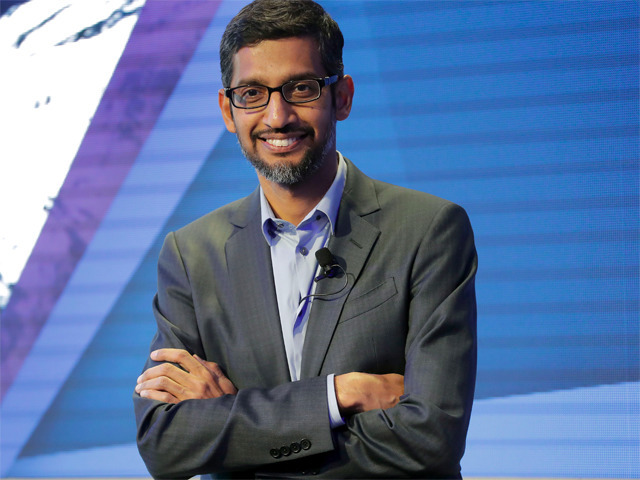 Pichai is a computer engineer and the current CEO of Google Inc.Pichai was born in Madurai, Tamil Nadu, India. His mother Lakshmi was a stenographer and his father, Regunatha Pichai was an electrical engineer at GEC, the British Conglomerate. Sundar's father also had a manufacturing plant that produced electrical components. Sundar grew up in a two-room apartment at Ashok Nagar in Chennai. Sundar has done his schooling in Jawahar Vidyalaya, a Central Board of Secondary Education (CBSE) school in Ashok Nagar, Chennai and completed the Class 12th. from Vana Vani school in the Indian Institute of Technology Madras. He did his B.Tech in Metallurgical Engineering from IIT Kharagpur and then won a scholarship to study materials science and semiconductor physics from Stanford University from where he eventually earned his (M.S.). Sundar planned to pursue a Ph.D. from Stanford and begin on an academic career. He went on to complete his MBA from the Wharton School of the University of Pennsylvania in 2002. After the completion of his MBA he was appointed as a management consultant at McKinsey & Company. Sundar joined Google in 2004. At the beginning, he worked on Google’s search toolbar in a small team. The toolbar gave users of Internet Explorer and Firefox easy access to Google search. He also worked on other Google products like Google Gears and Google Pack. The success of Google’s toolbar gave Pichai the idea that Google should develop its own browser. Pichai discussed his idea with his seniors and faced an objection from then CEO Eric Schmidt, who thought that developing a browser would be a too expensive. Pichai persevered and convinced the co-founders of Google, Larry Page and Sergey Brin, to launch Google’s own browser. Pichai played a key role in the final launch of the browser, Google Chrome, in 2008. Chrome proved to be a great success as it allowed the users to directly access Google’s search engine. Pichai became an internationally known grave image following the Extra success of the Chrome which lastly became the No.1 browser in the world, surpassing competitors such as Internet Explorer and Firefox. The Chrome also paved the way for a series of other important products like Chrome OS, Chromebooks, and Chromecast. In 2008, Pichai was promoted to Vice President of product development. In this position he started appearing more often at Google presentations and continued rising up the ranks in Google. In 2012, Sundar had become the senior Vice President of Chrome and apps. In 2013, Andy Rubin, the creator of Android, left to work on a different project. Larry Page then made Pichai in-charge of Android as well. His influence continued to increase and he was made the Product Chief in October 2014. On 10 August 2015, Sundar Pichai was named the new CEO of Google.In February 2016, he was awarded 273,328 shares of Google's holding company Alphabet, which led to a rise in his net worth. These shares were worth $199 million, and this took his holdings up to $650 million. 1.Sundar Pichai is a huge cricket fan and was the captain of his school cricket team. 2.His family did not get a phone until he was 12. 3.He once tried to talk a friend out of working at Google before joining the company himself. 4.Sundar Pichai joined Google even before the company went public. 5.He is very good at remembering numbers and even he could remember every telephone number he dialed when he was young. 6.He interacts with students at IIT-Kharagpur over Skype at regular intervals. 7.He was also one of the top contenders for the post of CEO at Microsoft, which ultimately went to Satya Nadella. 8.He has been the master of ceremonies at Google I/O for the past few years. 9.It is rumoured that Twitter tried to poach Sundar Pichai, a few year back, while he was working at Google, but Google paid him an intensively higher pay to prevent him.